When my husband dropped the camper trailer on his foot, it was surely the worst timing I could have imagined. It was two days before his annual leave and school holidays began, and two days before our very first camper trailer trip. My husband came hopping inside the house in excruciating pain after an accident involving the jockey wheel of our new Ezy Trail Camper Trailer. A few hours later at the Emergency Department, doctors confirmed that his foot wasn’t broken, but a week on crutches was in order. And that’s how we started our very first family holiday in our camper trailer – with crutches in tow. After a few days of moping around waiting for the foot to magically heal, we decided to do a practice run of putting up the camper trailer. 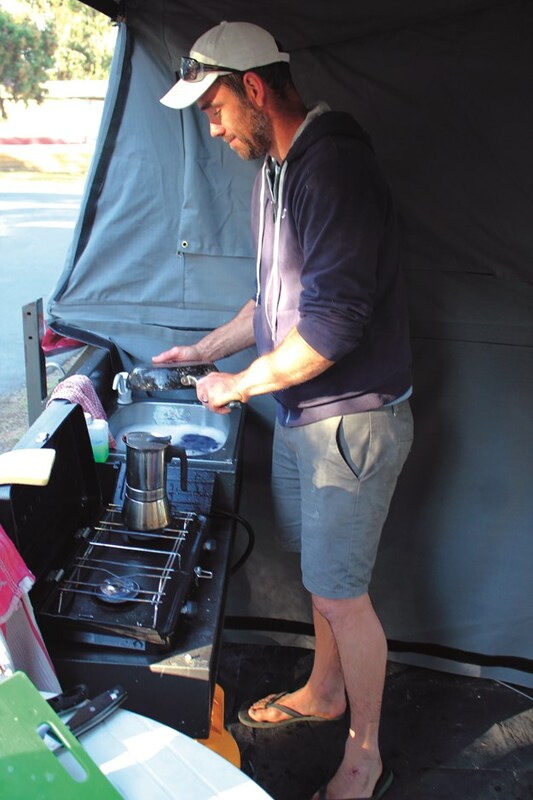 There are not many places that can fit a camper trailer in the suburbs of Melbourne, but we ended up next to the Maribyrnong River in Footscray, and managed to successfully set it up with only one and a half people. Motivated by our success, we bit the bullet, threw the kids in the car and were soon travelling down Victoria’s incredible coastline. Our car was literally about to burst with anticipation. Our children, aged four and six, sat in the back and didn’t stop talking the whole way to Tallawalla Campsite, about 90 minutes from Melbourne. Us? We were excited too, albeit mildly concerned about how we were going to get the camper trailer up with only one person able to walk. Our location was stunning. 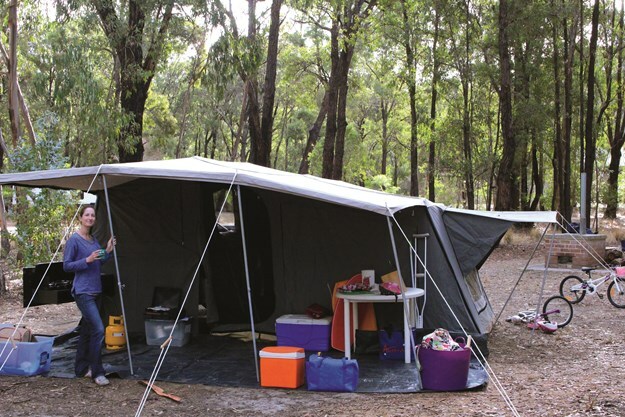 The campsite is nestled in bushland between the ocean and the Great Otways National Park in Moggs Creek, about 750m off the Great Ocean Road. We chose it because we wanted to try out the camper trailer closer to home, and we’ve stayed on the adjoining campsite, Tall Trees Camping, in the past. Tall Trees is a privately owned campsite with permanent tents and bedding and all equipment provided. 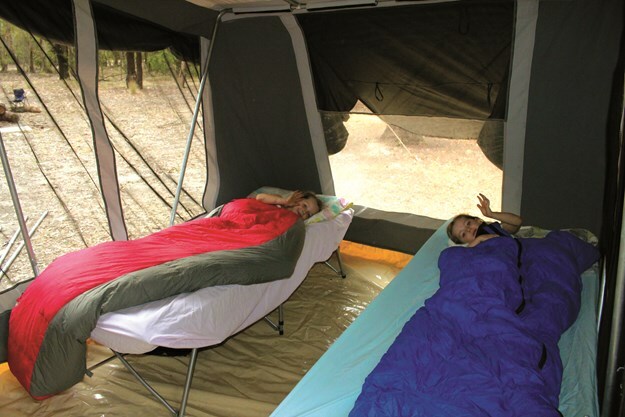 It was our perfect introduction into camping when our kids were younger, but with such amazing memories of camping as kids, it was time to take things up a notch and join the camper trailer world. 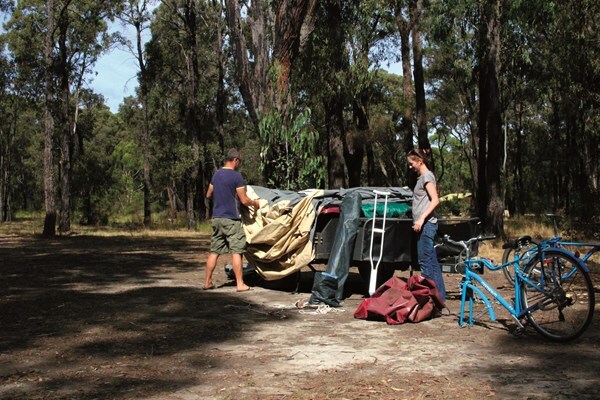 And when we finally bought our second-hand trailer on Gum Tree for $3700, the response from our friends was surprising. ‘Oh we’ve been wanting to do that for ages!’ they would cry, and ‘Can you tell us how it goes; ‘cos we’re dying to get one too’. 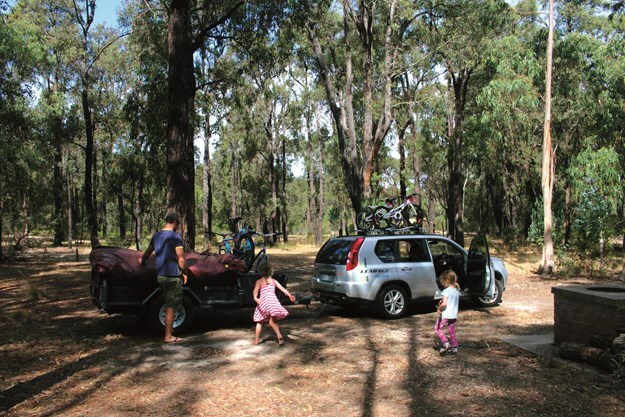 It seemed this was a ‘thing’ and we were now in a whole market segment of our own – my young family are part of the largest consumer group in the caravan and camper trailer industry (according to Tourism Research Australia). Well, there you go. There must be something good about this whole camper trailer caper if everyone’s doing it, right? WHERE DID YOU PUT THE INSTRUCTIONS ? With a crutch in one hand and me as the main muscle power, we managed to re-watch the YouTube video on how to get the camper trailer up, and actually do it. It took a while, I’ll admit, and there was a few bumps along the way. We couldn’t get the floor to sit flat – it seemed to pull on an angle and affected how the main door zipped shut. The poles weren’t labelled well (the stickers had come off) so it was trial and error to get those right. We worked out later that we should have pegged out the floor space first, before tightening the main poles. We had chosen a soft floor over a hard floor because it gave us more space for the kids’ sleeping area, and it meant the overall weight of the trailer was slightly less and easier for our car to tow. So we got there in the end. 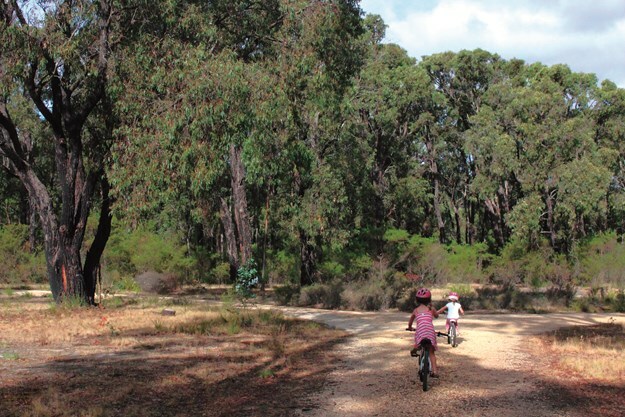 And the best part was that the kids entertained themselves by charging around the nearby bushland on their bikes, climbing trees and allowing us to set up. After a few nights we were well and truly hooked and well settled in a new routine. What’s not to love? The kids couldn’t get enough of going in and out of the tent, setting up little games in the main room, eating at their makeshift table (an upside-down tub) and roasting marshmallows by the fire. I was getting pretty used to not having power, wi-fi and having nowhere to be. And the bed – oh the bed! As a relatively light sleeper, with one ear always listening out for a child who may need me, I was beyond ecstatic to find out that the bed was really comfortable. I fell asleep to the sound of ocean waves, and woke to kookaburras. Seriously, no words can describe how that soothed my tired, frazzled soul. There is no doubt that all the worries of our day-to-day lives shrink once we get away from the city. Our six-year-old in particular adores the outdoors, and the anxiety that has plagued her since she was a newborn seems to diminish. She winds down, recalibrates and is more focussed when she needs to achieve something. And with no screens or planned activities, the kids remembered how to use their imaginations, and enjoyed riding bikes, swimming, bushwalks and kangaroo spotting. My husband and I took pleasure in the joys of patchy phone reception and rediscovered how to talk to each other. “Quick –write it down!” I’d say to my husband when we came up with an idea for next time. The little things were fairly obvious – bring a table (oops) for cooking and eating. Have a whole set of pots and pans that stay in the camper trailer. Buy a better quality lantern for bedtimes. Buy the whole family head torches so you don’t keep losing yours to the four-year-old as she goes on another night walk on her own (!). But the big stuff may need more thought. Do we need a portable toilet for night times? How can we keep the inside clean (um, good luck) and is there a bigger gas bottle option so we don’t run out halfway through cooking our spaghetti dinner? The destination was a winner, though. The Victorian coastline is hard to beat, and for good reason. We weren’t short of things to do – horse riding, bike riding, climbing, zip lining, surf lessons just to name a few. But there were days when we didn’t go near a town and just enjoyed being amongst the trees and nature with the family. We’ll definitely come back. All up, the pack-down took about an hour and 20 minutes. We were lucky that the kids were happy to entertain themselves on the little whiteboards we’d bought along. They were pretty tired from all the activity of the trip and the fresh air, so we tried to get it done fairly quickly. We’re confident that the pack-down time will get shorter as we get to know the camper trailer better and learn how to save time. One of the best parts was the extra space we had acquired in the car by having all our camping gear in tubs inside the trailer. WHEN CAN WE GO AGAIN ?